You’ll learn how to use creativity and innovation to accelerate solutions to human problems in organizations, families, and communities. Most appreciate innovation’s benefits, but few actively pursue it. Why? Innovation’s inherent risks induce a fear of failure that stifles creativity. But in fact, danger and failure are the adrenalin and catalysts of innovation— spawning adventure, exploration, and fun! And laughter is often the sound of an innovation being born. You’ll get comfortable with risk, and hedge against failure by preparing your mind using tools and techniques that you can put to use— right now, today. The nine included video programs cover concepts such as 6P Innovation® that can dramatically change the yield from your existing resources— creating greater value through the creation of game-changing new solutions. CEO of the Innovation Center, a non-profit think tank that helps organizations discover and launch their future. Shipping prices are for USA only. For international rates, call 541-362-1229. Competing in the world economy on a low-cost basis is no longer a viable option. Innovation is the engine of a vibrant economy. 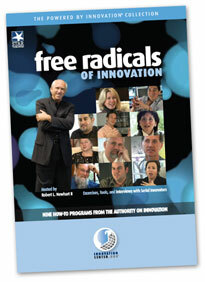 Many think of innovation as a new product. Innovation can center around promotion, pricing, place, people, process— and product. Most appreciate innovation’s importance, but few actively pursue it because the inherent risks induce a fear of failure, stifling creativity. When you refuse to accept the obvious, you’ve taken your first step toward innovation. With the right gear, you can prepare your mind for great leaps of inspiration. Success depends on the ability to continually think, rethink, and reinvent strategies, models, structures, systems, and relationships. Venture Capitalists view thousands of unsolicited proposals each year. How many proposals do you see each year? For innovators, what really matters is diversity of thought— different points of view. None of us are as smart as all of us. It’s two questions. One: what is the issue or problem you need to address? Two: what are you going to do about it?